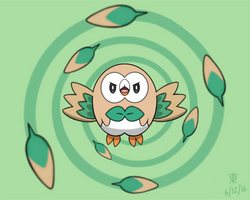 I painted this little friend way back when the starters were announced.....I stuck strong to my initial choice and chose Rowlet in Pokemon Sun, which I have been playing in between work. I might draw some more Pokemon art to celebrate!! Of course! Your pokemon arts are great, keep it up I will look forward to seeing more! Thank-you so much, I hope that I can get back into art whilst on my break from uni, I have lots of sketches I'd love to complete and your support means a lot! Good luck for them all! Very nice! The coloring and shading is really well-done ! We all live in a Pokemon World! !